"Saturday Night Live" was hosted by Seth Meyers. Alec Baldwin made his return to "Saturday Night Live" this week as the show tackled the insanity that was the Kanye West-Donald Trump meeting in the Oval Office. The bit opened with a CSPAN graphic saying the discussion included topics such as "alternate universes," "Superman" and "flying cars." Kanye, played by cast member Chris Redd, immediately launched into a tirade, espousing the virtues of his "Make America Great Again" hat. "Yeah that's right, I flew here using the power of this hat," he said. NFL Hall of Famer Jim Brown, played by Kenan Thompson, was "already pretty nervous." "I've got an amazing lunch to get to, but first I'm sure that Kanye wants to make one or two brief, lucid remarks," Baldwin said. "Time is a myth!" Kanye shouted. Through voiceovers, it didn't take long for Baldwin's Trump to realize that Kanye was him: "Oh my God, he's black me." "I played football with a leather helmet and my brain is still working better than his," the faux Brown said. But Baldwin's Trump still felt like he came out of the meeting on top. "Remember the lesson from today, black people love me -- way more than they love Alec Baldwin," said Baldwin. 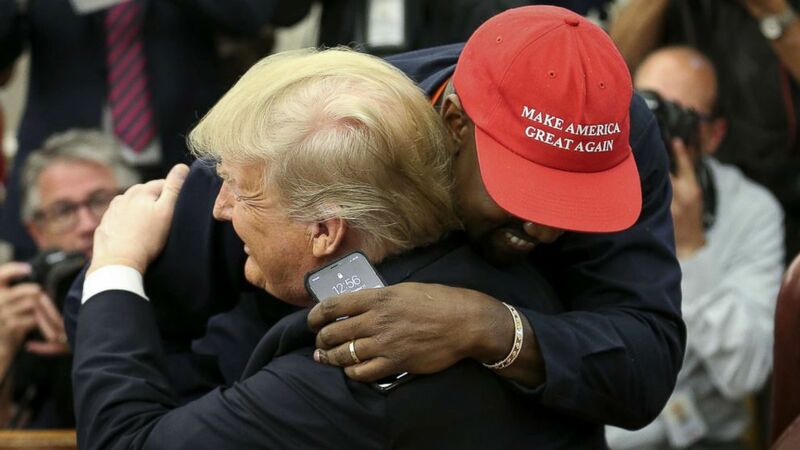 (Oliver Contreras/Getty Images) President Donald Trump hugs rapper Kanye West during a meeting in the Oval office of the White House, Oct. 11, 2018. Of course it was only after the sketch that host Seth Meyers told the funniest bit about Kanye. He revealed that he was there when the rapper made a guest appearance and they pitched a sketch to him about interrupting award shows. "That's hilarious, because I do that," West responded, according to Meyers. They ended up doing the sketch, mocking West's craziness. Meyers then broke the news that the sketch was in 2007, two years before he interrupted Taylor Swift in 2009.